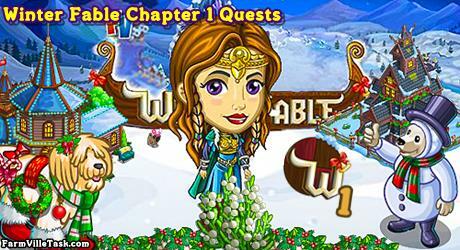 We will meet a new friend named Eira in FarmVille Welcome to the Kingdome of Viken, a Winter Fable Chapter 1 Quests. The Winter Fable is a new farm extension that will be opened. We will help our friend in one of the adventures. On this chapter of Winter Fable Quests, we will be crafting 6 recipes at the NORDIC TAVERN. Prepare ahead the bushels that will be used to craft these recipes. Collect them early and save it for the quests. Note: Expected to be released on Monday (December 3). Quest Handicap: 80 – 70 = 10 amount to harvest. Info: Crafted at the NORDIC TAVERN and will need Ornamental Grapes Bushel x9, Frost Berries Bushel x9 and Mistletoe Cherries Bushel x6. Info: Crafted at the NORDIC TAVERN and will need Nisser Cinnamon Sticks Bushel x9, Elven Banana Bushel x9 and Gingerbread Ornament Bushel x9. Info: Crafted at the NORDIC TAVERN and will need Ornamental Strawberry Bushel x4, Pinecone Nisser Bushel x4 and Snowman Pear Bushel x4. Info: Crafted at the NORDIC TAVERN and will need Frosty Pinecone Bushel x6, Lemony Jingle Bell Bushel x6 and Nisser Cinnamon Sticks Bushel x6. Info: Crafted at the NORDIC TAVERN and will need Snowball Gooseberry Bushel x9, Frosty Pinecone Bushel x9 and Gingerbread Star Flower Bushel x6. Info: Crafted at the NORDIC TAVERN and will need Elven Banana Bushel x6, Dewdrop Avacado Bushel x6 and Glitterflake Flower Bushel x6.